Winner of the 2015 Young Writers Contest! By the time Spanish explorers reached the Americas, the Aztec Empire was one of the greatest in the world. The ancient priests would slaughter sacrifices, sometimes by the thousands, all under the claim that their gods needed blood to make the sun rise every day. What would have happened had this empire prevailed over the Spanish and survived to this day? How would its bloodthirsty theocracy fit in with our world? Myla is an upper-class teenager in modern-day Azteca, partying her days away with her friends and the man who has claimed her as his wife. On her seventeenth birthday, she is finally “enlightened” and told the truth: that the Priesthood is lying to everyone. Then, in an intriguing twist of fate, she finds herself in the hands of Azteca’s rebels and their leader, Tezca. Myla must now sort through all the lies she has been told her whole life and confront old secrets buried deep. Can she trust these people? Are they terrorists or revolutionaries? And will she join them to dismantle the theocracy and its lies? 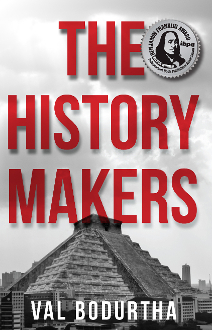 The History Makers received the 2018 Silver IBPA Benjamin Franklin Award for Teen Fiction. The IBPA Benjamin Franklin Awards are regarded as one of the highest national honors for independent publishers.